I’ve got a special request. Today I’m not only sharing a delicious soup recipe, but I wanted to encourage you to help raise money for the hungry! One minute and 42 seconds is all it takes. Well, unless you decide to read this entire post, then it might take longer! Wondering what on earth I am talking about? Here in Ohio, we have an Ohio Pork Producers Council. Along with some hog farmers and other partners, they are raising money for local food banks in my state of Ohio! By watching this fun “Pork from Fork to Farm” you tube video (1 minute, 42 seconds) they will donate 1lb of ground pork to local food banks for EVERY VIEW. It’s that easy! I personally love buying local meats and dairy products, so knowing the local food banks will get that same advantage is a nice feeling. I always hear that it’s best to donate what YOUR family would eat…not the canned stuff in the back of the pantry that nobody likes. And my family loves pork! You may have seen here on Shugary Sweets a few dinners featuring this delicious protein. I have another great recipe for you today! Lasagna Soup! My husband does not like lasagna. The ricotta cheese is the main culprit. I was a little worried about making lasagna soup, but it went over quite well! He actually loved it, and there was no ricotta cheese to scare him off! 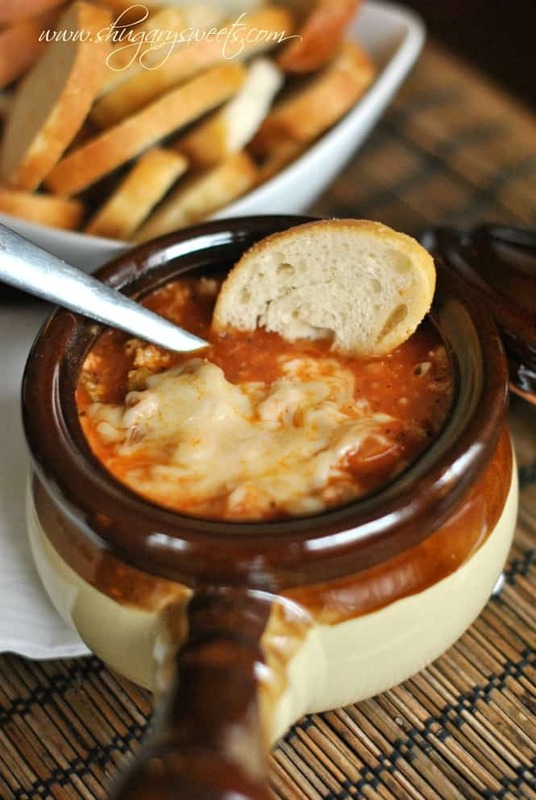 Easy, delicious Lasagna Soup recipe. All the flavor and comfort food in a delicious bowl! In a large soup pot, brown ground pork with onion, green pepper and garlic. Add chicken broth, tomatoes, tomato sauce, and seasonings. Bring to a boil over medium high heat. Boil 2 minutes, then reduce to a simmer and cook for 30 minutes, covered. Stir occasionally. Add bite sized lasagna noodles to soup and cook until tender (about 15 minutes). Some other Ohio bloggers are sharing pork recipes today too! Be sure to hop over and see what’s cooking in their kitchens! Wendy is sharing some Sweet and Spicy Pork Lettuce Wraps! Sounds delicious! Lucrecer is celebrating pork with some Ginger Teriyaki Sliders. These are going on our menu soon! Tara cooked up some Pasta alla Bolognese! Sounds fancy but looks amazing! Don’t forget to watch the you tube video “Pork from Fork to Farm” to help raise food for the hungry! **This is a sponsored post on behalf of the Ohio Pork Producers Council (OPPC). I was compensated for my time, however all opinions expressed are 100% my own! I have never had lasagna soup! It looks absolutely scrumptious! So fun to be supporting this cause with you! Thanks! happy to be doing this with you too! My dad hates lasagna and ravioli for the ricotta, too. Not sure why, I think it’s delicious. 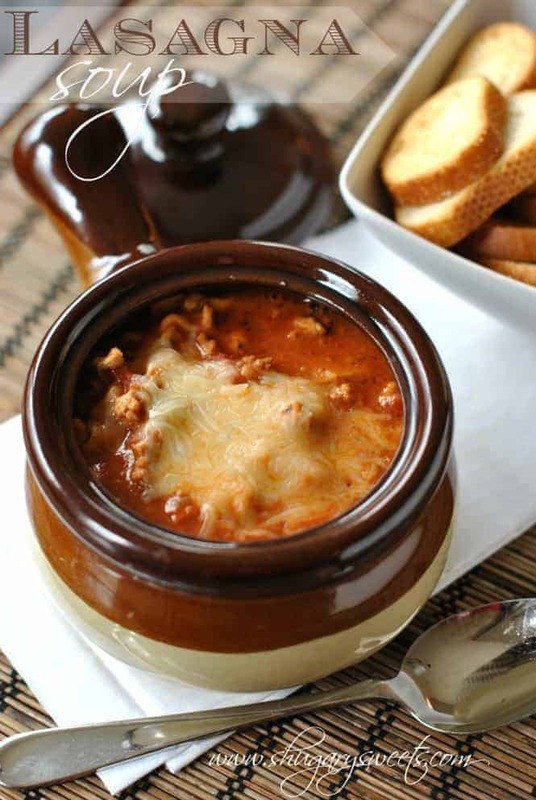 Lasagna soup sounds like an AMAZING idea! I think it’d be good with a bunch of veggies, like a vegetable lasagna, yummmm! You font have to give up homemade lasagna recipes. I don’t like ricotta cheese either. Whenever I make a lasagna recipe I sub cottage cheese for ricotta. Works great! Unfortunately my husband doesn’t like cottage cheese either. But I do usually mix cottage cheese with ricotta for my side of the lasagna! What a great cause! 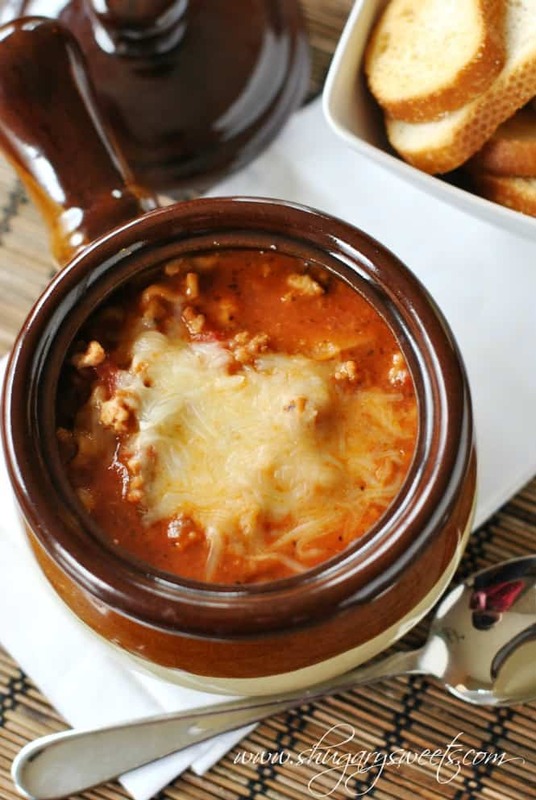 We love lasagna soup but I have never used pork…what a great idea! It looks delish!!! And your hubby doesn’t like lasagna…I have never known anyone who didn’t. Does he like cottage cheese? That’s how I grew up eating lasagna. Nope, he hates cottage cheese too! he’s actually a picky eater, my talents are wasted on him, LOL. We are big lasagna fans but always substitute ricotta for cottage cheese since we aren’t fans of ricotta. 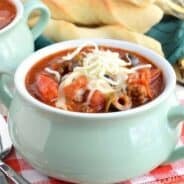 We’ve never had lasagna soup but it sounds like it would be a wonderful addition to our dinner rotation! I have occasionally substituted too, but usually I use half ricotta, half cottage cheese. I love the taste of ricotta and the creaminess of the cottage cheese. Win Win. Enjoy the recipe Eva! I’m so happy you are spreading the word about this video! Done and done Aimee. Also lasagna soup? What a lovely comfort meal. I’m not sure about Ohio, but I definitely still need warming up here in snowy WI. Spring PLEASE!! Thanks Erin 🙂 And yes, definitely need some warming up here in Ohio! Comfort food. I have never thought to have this as a soup. I can hardly wait to try this out! Thanks! So fun to be doing this campaign with you, a fellow Ohio foodie! I love soups Aimee and I love pork!! This looks like a hearty and flavorful soup! 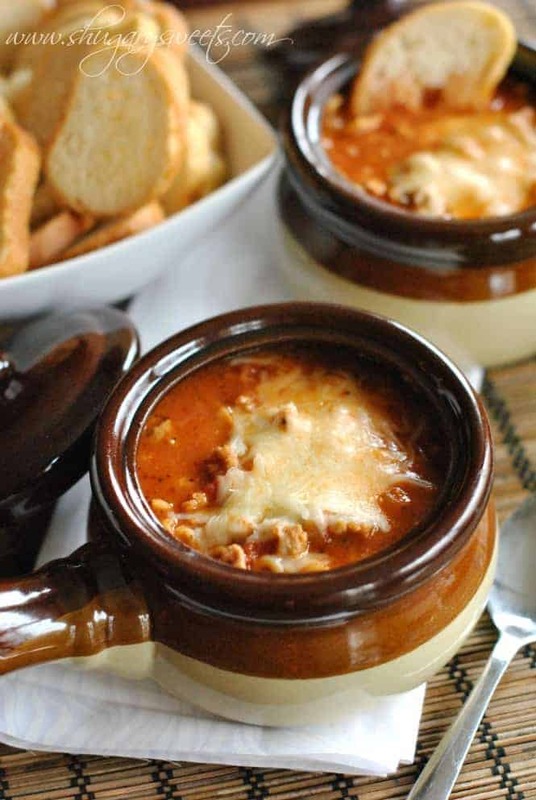 Lasagna Soup sounds like a truly amazing idea! I also am not too keen on riccotta- this sounds like the perfect solution! No ricotta in this soup to scare you off. The parmesan adds a yummy cheesy touch! This looks delicious! Luckily there is still snow on the ground and I have most of the ingredients in my pantry. I think that’s a sign Caitlin! Enjoy! It’s always so weird for me to see Ohio bloggers because I’m always like “Wait, I’M from Ohio” and apparently my brain thinks I’m the only one :P, plus it fails to comprehend that I’ve lived in NY for 4.5 years lol. I just discovered your blog last week (I think on Pinterest? ), and I’m so glad I did! I’ve loved all your recipes so far, and I’m thrilled that you’re a pork fan, too! I like to buy ground pork because it’s a little cheaper than ground beef. And I love a good pork burger! Thanks for this great recipe! Oh, I bet my family would love this — can’t wait to try it! Thanks Tara! It’s an easier way to enjoy lasagna! I’ve made lasagna soup couple years ago and we loved it. Time to make a new batch. Thanks for sharing. You’re welcome, thanks for stopping by Helene! We love lasagna soup in our house! It’s so good and easy! I sub the ricotta cheese for cottage cheese because we don’t like ricotta either! Lasagna soup is so much easier than making the real deal! Kathy, I usually use half ricotta and half cottage cheese in my lasagna recipe 🙂 But the soup? not needed, still delish ! Just watched the video 😀 Always glad to help, especially when it’s as simple as a few minutes of my day. Also – the temp dropped today and it’s cold all over again…..which means perfect weather for this soup! Thanks for watching the video! And yes, a chilly day is perfect for this soup! The Ohio Pork Producers made a great little ad!!! I used to be a member of the South Dakota Pork Producers (don’t know why I mention it). I happily watched the video – feeding the poor is very important. Thank you for supporting this cause Roberta! This looks really great, Aimee! I’m crazy about soup and lasagna, so this would be perfect for me. It’s certainly easier than dealing with all of those layers! I’m right there with you on the healthy soup thing. 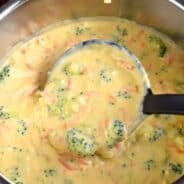 At Panera I always ordered the Broccoli Cheese soup. I knew in my head that it wasn’t healthy, but you know, Soup. Healthy. Then they started showing calories on their menu, LOL. Oh man, this looks absolutely delicious. I love lasagna to begin with but as a soup?? And with pork? Yummm I need to put this on our weekly menu asap! What a great cause, and this soup looks A-MAZI-NG! Thanks for supporting this cause Deb!! What a great cause Aimee! Off to watch the video! What a great cause! And this soup looks so comforting. As a huge fan of lasagna, it is right up my ally. It is a great cause, thanks for your support! And the soup is the perfect comfort food, easy and delish. Let me know what you think Daniela! What an awesome cause! And also, an AWESOME soup. We love all things lasagna, so I’m making this for sure. Love it, Aimee! Thanks girl, let me know if you try it for dinner!! yay, going to watch it now!! Love this! Great way to prepare lasagna! Thanks Mandy, it’s so tasty!! I think this is so wonderful and a great cause. Thanks so much for giving us, your readers, a chance to be involved in something worth while as this! This has me hoping it’s actually cold this weekend so I can snuggle up with a big bowl of this stuff…looks delicious! Mmmmm this soup looks mega comforting! This looks absolutely, positively incredible, Aimee!!! I’ve been wanting to try this soup…now I have the perfect recipe. Thanks for sharing! You are welcome, enjoy the soup! WOW! This looks like a fantastic soup! That is an amazing cause! And an incredible looking soup! I was just saying that I really wanted to try Lasagna Soup! I’m a mind reader 🙂 Let me know if you try it!! This looks amazing!!!!! Definitely making this! ENJOY Melissa! I’d love to hear if you try it! okay so i made this into a slow cooker recipe and it worked – I browned the meat, peppper, onion, garlic mixture. Then put all of it into crockpot with all other ingredients (not cheese) and cooked on low for 4-5hrs. Then added parmesean into the pot and put mozzerella on individual bowls. Noodles were pretty soft but still REALLY tasty! What a funny video. I have never had lasagna soup either but it looks soo good! I seriously plan on making this for the family tomorrow! We need a change! Had this for dinner tonight! Delicious! Two thumbs up from my husband and I would definitely serve it again! Subbed a can of spaghetti sauce for the tomato sauce and we loved it! Easy to make and fairly quick! This looks so yummy! I love lasagna soup! Definitely going to put this one on the to-do list! What kind of green pepper? Bell? Or spicy? This is one of the best soups I have had. I love lasagna and the soup just made it even better. I will confess that I used ground beef. I don’t like pork, but I still really wanted to make it. I found you on Pinterest. Thank you for the great recipe. The best soup I have had in a long time. I love lasagna and making it a soup was an added bonus. I must confess I used ground beef. I just do not like pork. Thank you for a great recipe. Made the soup for dinner tonight…delicious!!! Although we did decide it is not “company” soup…lots of yummy melting cheese made it a little messy! I loved the simplicity of it. I had browned ground beef and onions in my freezer already, so it was very easy to come home after work and whip up a great meal! Thanks for the recipe!!! Hey – this looks delicious! You say your husband doesnt like lasagne because of the riccota cheese….. just wondering if you’ve ever tried to make it without using that or cottage cheese? I’ve been making lasagne for 20years and never used either…. over here (Scotland) we tend to use a slightly cheesed bechamel sauce instead – ie layer meat in the tomato sauce, then lasagne, then bechamel sauce sprinkle with a mix of grated cheddar and mozzarella, then meat sauce again, lasagne, bechamel etc until the dish is full ending with a layer of lasagne on top of which you pour remaining bechamel sauce round the edges and then the remaining meat sauce in the middle, another wee sprinkle of the cheeses and then bake in oven for as long as your pasta requires (fresh obv cooks faster). It makes a more saucy lasagne to be fair however if you cook it the day before you’re having it then it firms up and is even more tasty. Just a wee suggestion to try for him if you havent before! Sounds great! I am the one here who doesn’t like ricotta..this sounds perfect! We made this for dinner tonight! It was a HUGE WINNER! I added andouille sausage and an extra bell pepper and a little extra water… oh yummmmmmmmm! So glad you enjoyed the recipe Betsy! Andouille sausage sounds delicious in the soup! 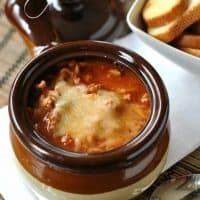 the lasagna soup idea is amazing!! This is one of my favorite kinds of soup! Healthy and filling, just how soup should belasagna for ricotta cheese for extra nutrition benefits! I had featured u in the post of Top 7 Nutritious and Wonderful Soups on AllFreshRecipes, looking forward to ur more eats! I made this for dinner tonight and it was a big hit with the entire family – even the picky toddlers! I’m so glad the entire family enjoyed the soup Lisa! Thanks for stopping back and letting me know! Made this for tonight’s dinner substituting ground beef and beef broth for the chicken. It was delicious. When I clicked the link, the video was unavailable. I tried and it failed. I did get everything in the crock pot earlier today (minus pasta). My son (who has autism and is a somewhat picky eater) is getting excited to try it! I know my house smells fantastic so that’s making me excited to try it! Thanks for the wonderful recipe! I haven’t tried that! Let me know if you do! Used italian sausage, so good I may never make regular lasagna again! So glad you enjoyed the soup! Such a fall favorite around here. I did add some ricotta to cream it up. This is the best soup! My husband & I love it. 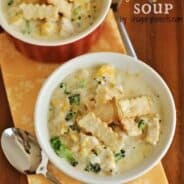 I have 15 family members coming on Sunday that all want to try this soup. I’m excited to see how they like it. I’m going to need a huge pot as I’m going to have to triple the recipe. Trying to figure that out as I don’t have anything bigger than 6 qt. pots. Thanks for a fabulous soup recipe. Such a yummy soup! We’re vegetarian, so I made this with crumbled 5 grain tempeh with pork chop seasoning, veggie broth and extra veggies. It came out amazing. Thanks for the recipe! Awesome! Random but I love these bowls! Where do you get them? I’m Australian and had never had lasagna with ricotta/cottage cheese until recently. We always made it with béchamel sauce (think white sauce with cheese) which is quite different to the ricotta versions. Maybe your husband would like this version. Definitely worth a try! Thanks Michele! This recipe was very good. Some changes I am making for the next time I make this… Going to go half pork burger/Italian sausage. I’m also going to use bow-tie noodles, or elbow. Breaking the lasagna was a mess, so I will be skipping that part for sure. I’m making this soup for the second time and everyone LOVES it! Thank you so much for the awesome recipe. I will be making this very regularly! Looks delicious. I will have to try this for dinner(maybe add cream cheese). If your husband likes cream cheese you should try that in you lasagna. My mom and grandma have been making their lasagna with cream cheese instead of ricotta. The only thing I substituted was 1 pound of fresh ground turkey instead of pork. It was delicious! I made this tonight and my husband and I both LOVED it. It is a bit messy to eat with the melted mozzarella. My husband (who used to work in a pizza shop) suggested provolone cheese because it’s not as messy. I may try that with the leftovers – just lay a slice across the top of the bowl! So happy to hear, love the idea of provolone too! I sometime make my lasagna with sausage and sometimes with ground beef. Would using beef broth with ground beef be an acceptable substitution? Do I have to use whole wheat lasagna? In Italy doesn’t exist anything like that. The original real Italian lasagna is made up of pasta, ragù bolognese, Italian parmesan and bechamel and nothing else. This is a simple soup with meat and tomato. In Italia non esiste nulla del genere. Made this last night and just had it again for lunch. Even better the second day! Delish! Next time I will pour off fat after browning pork to make it healthier. Thank you so much for the yummy recipe! We made this soup last night and it was delicious. The only change I made was using regular lasagna noodles. It is lunch for both my husband and I today! Loved It! Made this tonight – so good! Everyone liked it, and I appreciated all the simple, inexpensive ingredients. I’ll be making this again! So happy to hear it! Reminds me to put this back in our dinner rotation! I found this recipe with looking for ideas for leftover lasagna! I’m thinking of cutting up the lasagna into bite size pieces & adding chicken or beef broth with it in my crock pot! My lasagna is basically veggies with a half pound of cooked ground sausage, & I always replace the ricotta with cottage cheese. Cottage cheese is healthier, & half the price! My family never even noticed this change! They still love it! Serving size 1. One cup?